Whenever I get a little personal on this site, I often focus on two topics. One is how awful high school was for me. The other is how awesome my parents are. I’m sorry if it sounds like I’m bragging, but I’m just being honest and truthful. They really are that awesome and I intend to belabor that every chance I get. As it just so happens, Mother’s Day is tomorrow and since I have such a wonderful mother, I’d like to share a personal story that I hope conveys a larger message about masculinity, in general. I promise this isn’t going to be another complex exploration about bogus topics like “toxic” masculinity or double standards. It’s just a simple story about my amazing mom and how she helped me grow into a better man. There are a long list of stories I could share. Some of those stories I’m sure my mother would prefer I kept private. There are plenty others I’m sure my mom would love for me to share, if only to document some of the more memorable moments our family has shared over the years. Since I know she occasionally reads this site, I think she’ll agree that this is definitely one worth sharing. That’s because it involves roller coasters. That’s not some elaborate metaphor. I’m dead serious. This is a story about me, my mother, and roller coasters. It’s kind of what it sounds like, but I promise it has other, more meaningful connotations that I think are wholly appropriate on the eve of Mother’s Day. First, I need to provide a little context. This particular moment occurred when I was around ten-years-old. That’s relevant because that was the age when I was finally tall enough to ride most of the rides at amusement parks like Six Flags and Kings Dominion. As it just so happens, both are within a two hour drive of where we lived. My mom, being the wonderful person she is, used that as opportunity to plan a day-long trip to Kings Dominion. I went with my younger brother, my aunt, and a cousin of mine. It was blazing hot, but being an energetic kid, I was too excited to care. I don’t even remember complaining with my mom urged me to put on extra sunscreen. After spending about an hour just exploring the park, doing some small rides and playing some games, we came across a roller coaster that, to my 10-year-old mind, might as well have been Mount Everest. I’m not saying I was an overly fearful kid, but this was uncharted territory for me. My first instinct was not to go on such a ride. To some extent, that was my default instinct to that point in my life. I know kids at that age can be both frustratingly reckless or annoyingly helpless with very little in between. It’s an age where kids still cling to the safety of their parents, but are just starting to feel that inclination to explore the world. I was probably more reluctant than most kids my age. Both my parents and siblings would probably admit that I was a very self-disciplined kid, often to a fault. I did not like going out of my comfort zone and taking chances. I even complained when I had to, as kids are prone to do. On that day at Kings Dominion, though, my mom gave me an extra push. She never shoved me or pressured me. She got encouraged me, getting excited about the ride so that I got excited too. Before long, that excitement overrode any fear or reservations I had. Thanks to that encouragement, I went on the ride with her and to this date, I feel like that was a pivotal moment in my young life. At the time, though, it was just an incredible thrill. I loved it. I loved it even more than my mom promised. I remember getting off that ride, feeling dizzy and unable to stand. I probably looked like I was drunk, but I didn’t care. I had so much fun and so did my mom. We went on that ride again. It was the first of many. From that day forward, my mother and I became the roller coaster aficionados of the family. 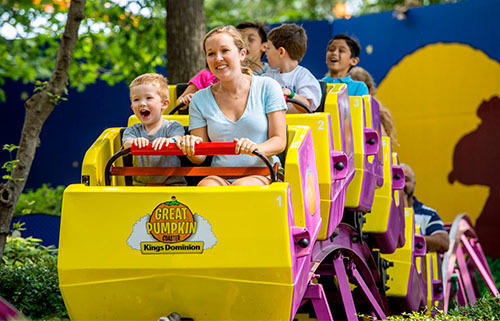 Whenever we went to an amusement park, be it Kings Dominion, Six Flags, or Disney World, my mom and I would jump at the chance to ride the biggest, scariest ride. Sometimes friends, siblings, and cousins would join us. Other times, they would chicken out. My mom and I never did. Those were wonderful times. They’re among some of the fondest memories I have with my mother as a kid. Beyond the thrills and adrenaline, though, I find those experiences had another effect on me. This effect was more personal, though. It also played a major part in the critical, yet often treacherous process of a kid growing into an adult. By taking a chance on those roller coasters, doing something risky for once, my mom taught me a valuable lesson about being an adult and a man. She showed me that sometimes, we need to embrace a little danger. We need to leave the safety of the familiar and explore new, potentially hazardous experiences. That kind of mentality takes both bravery and even a little foolishness. It’s a combination of traits often associated with masculinity, being willing and able to take those risks for new and exciting experiences. I’m not saying that men are the only ones who have such risk-seeking behavior. Women can be every bit as adventurous, as my mother so aptly demonstrated. For me, the ten-year-old boy who still saw himself as such, those experiences marked the early steps of a more profound maturation process. It wasn’t just that I was now old enough and tall enough to ride all the roller coasters at most theme parks. I realized that my experiences didn’t just have to be kid-friendly experiences. I could take chances, venture into once-forbidden areas, and explore life in ways I hadn’t dared. Doing that can be scary and sometimes requires a little encouragement, not unlike the kind my mother gave me that day at Kings Dominion. It can also be very rewarding, as the rush from an awesome thrill ride so wonderfully proves. I was still a shy, reserved person, even as I entered adulthood. I still took longer than most to emerge from my shell. However, thanks to my wonderful mother and her loving encouragement to try out a few thrill rides, I understood what it meant to be an adult and a strong man. To my mother, and all those wonderful mothers who encourage their children with the same love and care, I thank you. You helped teach me how to be brave, how to embrace the adult world, and how awesome roller coasters are. For that, I will be forever grateful. To her and to all the other mother’s out there, Happy Mother’s Day!